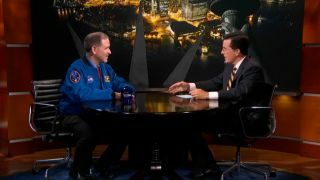 TV comedian Stephen Colbert discusses NASA's Mars rover Curiosity landing with astronaut John Grunsfeld, NASA's associate administrator for science missions, in this still of a Comedy Central broadcast on Aug. 1, 2012. NEW YORK — Even TV comedian Stephen Colbert isn't immune to the excitement surrounding the historic upcoming landing of NASA's newest rover on Mars. "That's not science fiction — that's really going to happen on Monday," Colbert said following the animation. "Whether there's life elsewhere is the big, fundamental question," Grunsfeld said. "This is a big step — a big step in that direction."